The Oakland Athletics have signed 26-year-old Taiwanese left-hander 王維中 (Wang Wei-Chung) to a minor league deal with spring training invite. Reporter Melissa Lockard was the first to broke the news on Twitter after she noticed Wang’s name on the Athletics’ non-roster invitees list for the 2019 spring training. Apologies if this was already out there and I just didn't see it but left-hander Wei-Chung Wang has been added to the #Athletics NRI list. Has appeared in 22 MLB games as a reliever, was in Korea last season. With Wang Wei-Chung joining the Athletics organisation, he became the third Taiwanese players that signed with the A’s. After Wang Wei-Chung left the MLB system, he signed with the NC Dinos in the KBO. In 2018, Wang went 4.26 ERA, 1.48 WHIP across 25 starts and 141.2 innings. With Wang being the relief pitcher within the Brewers’ system the previous year, as many expected, Wang ran into some fatigue problems towards the latter half of the 2018 KBO season. 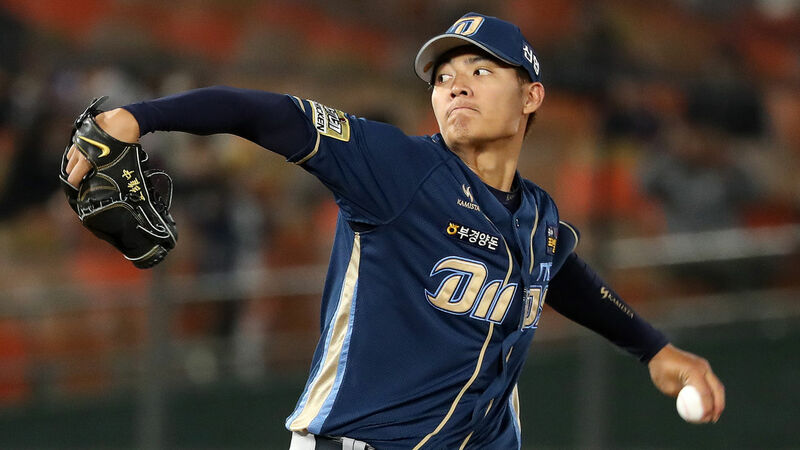 Despite missing a few starts, Wang still finished the 2018 season being the ace of the NC Dinos. However, the team still decided not to re-sign Wang at the end of the season. In 2011, at the age of 18, 王維中 (Wang Wei-Chung) was signed out of Taiwan by the Pittsburgh Pirates as an international free agent. In 2013, Wang was picked up by the Brewers during the Rule 5 Draft and made his MLB debut in 2014, thus jumping from the rookie league straight to the MLB. 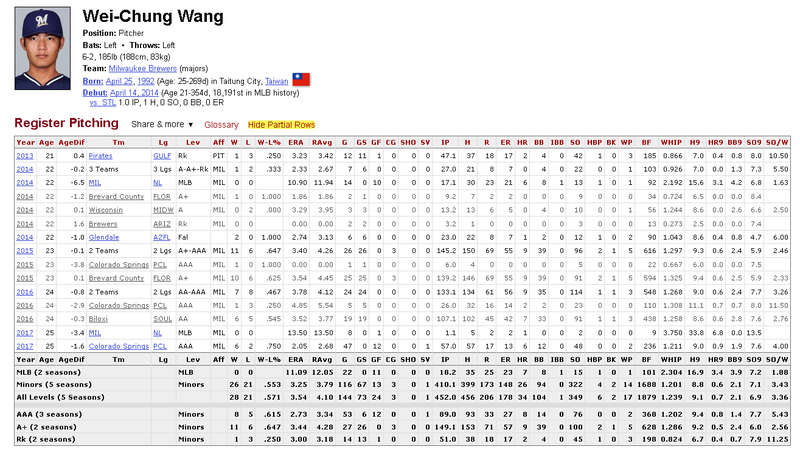 After his mandatory MLB tour in 2014, the Brewers sent Wang down the High-A in 2015 for further seasoning. Wang eventually reached Triple-A in 2016 and had another short stint in the MLB the following season. Wang spent the majority of his 2017 season in the Triple-A. In the hitter-friendly Colorado Springs, he wound up posting a 2.05 ERA and a 1.21 WHIP across 57 innings with 48 strikeouts and 12 walks. Assign to Triple-A in 2019? With his return to the MLB system in 2019, it is very likely to see the A’s assigned Wang to Triple-A, given his previous track record within the Brewers system. It is also worth noting, as of today, there are only two left-handers on the Athletics’ 40-man roster. The A’s also just signed Tyler Alexander, the 27 year old Mexican League left-hander who I thought would be a top CPBL prospect this off-season. Oh yeah, I saw Alexander’s name during that “Chien-Ming Wang”, “Wei-Chung Wang” incident on twitter the other day. Happy to see Alexander finally got another shot in the MLB system. So, they will be teammates the Triple-A it seems.The other Wang’s NC Dinos teammates Logan Verrett was picked up by the A’s too. The KBO are certainly doing something right with their foreign players signing. A lot of them are able to find their way back to the MLB system. On the other front, Fubon Guardians’ Henry Sosa apparently turned down a Cubs minor league contract.